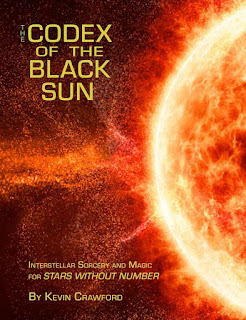 Codex of the Black Sun! Insterstellar Sorcery and Magic for Stars Without Number! Now this sounds right up my alley! I haven't picked it up yet, due to an unexpected plumbing expense, right here before Christmas, but I will be getting this asap. I haven't posted much about SWN in awhile, but did a good bit of stuff for the original version. Played a session of it at a Con awhile back. I can't wait to see what goodies are in this latest release. 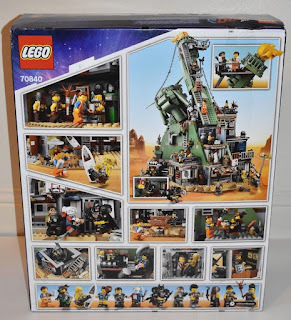 If you have this, I'd be curious to hear your thoughts about it! Kevin Crawford does great work. 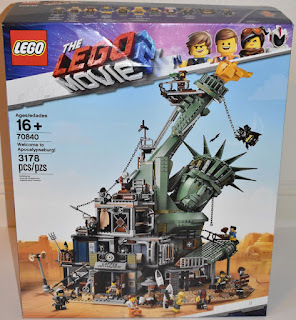 I haven't posted about lego in quite awhile, but yes I am still an Adult Fan of Lego, now that I have a grandson I have an extra excuse to prowl the lego aisles at the local store. I have to admit this looks really cool, and appeals to the P.A. (Gamma World) fan in me. P.A. Green Lantern is cool looking, although I think Batman seems to be trying to overcompensate for something! 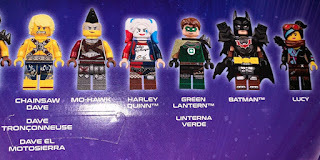 Now I feel the need to assemble a lego Ape mini-fig army. 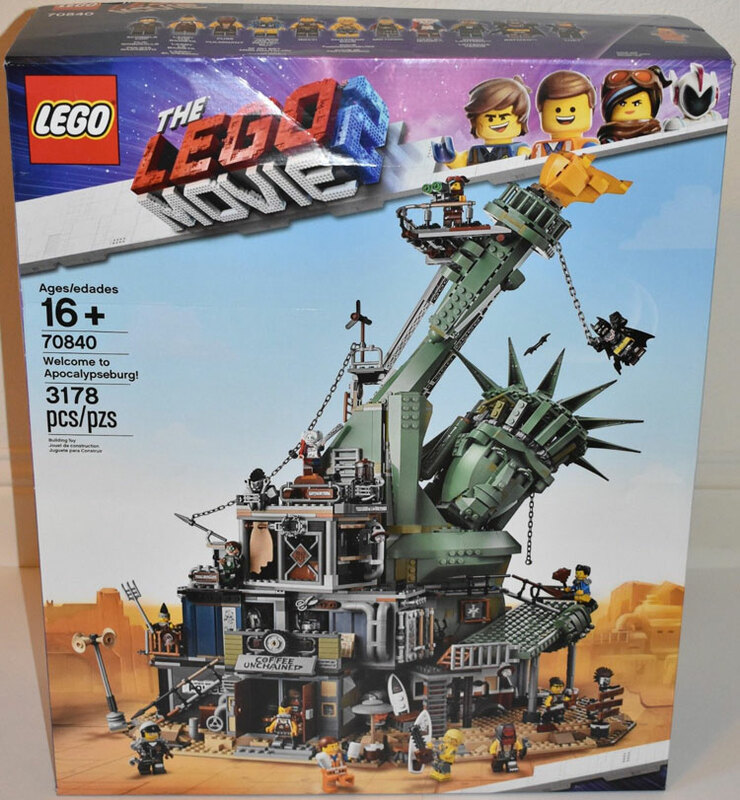 I'm sure this set will be ridiculously expensive, but wow it is cool looking! Have a great weekend! 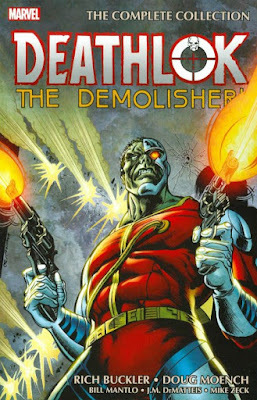 My recent post about my acquisition of the Deathlok TPB. Got me thinking about the first comic I picked up that had Deathlok. That was Marvel Two-In-One #53. 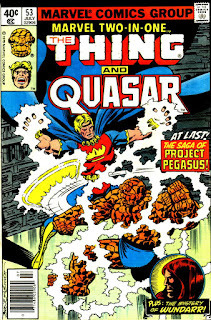 Featuring The Thing and Quasar. This was my first time reading about Quasar, and Deathlok (spoiler) with Deathlok only showing up near the very end of the comic. 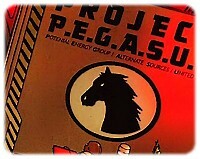 This comic also featured Project Pegasus. 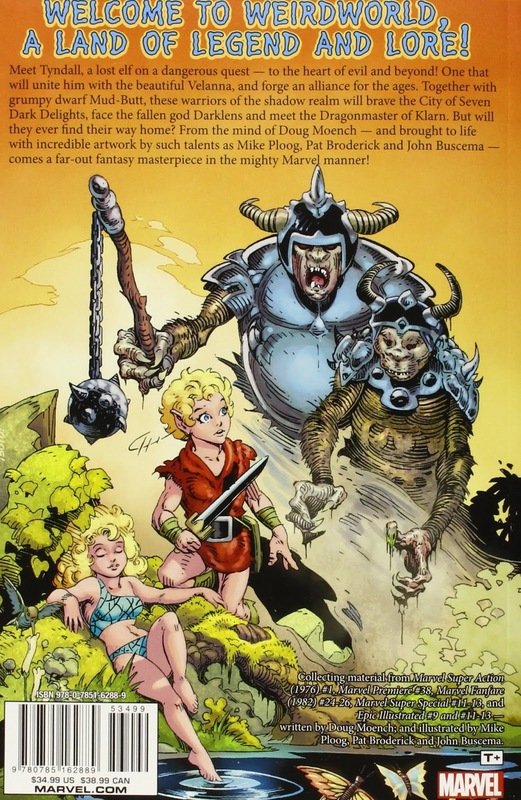 The timing of this comic was pretty important to my formative gaming GMing years/experience. You see as I have mentioned a few times in the past. 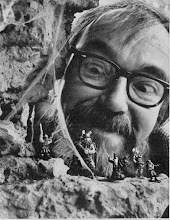 D&D was NOT my first RPG to GM. 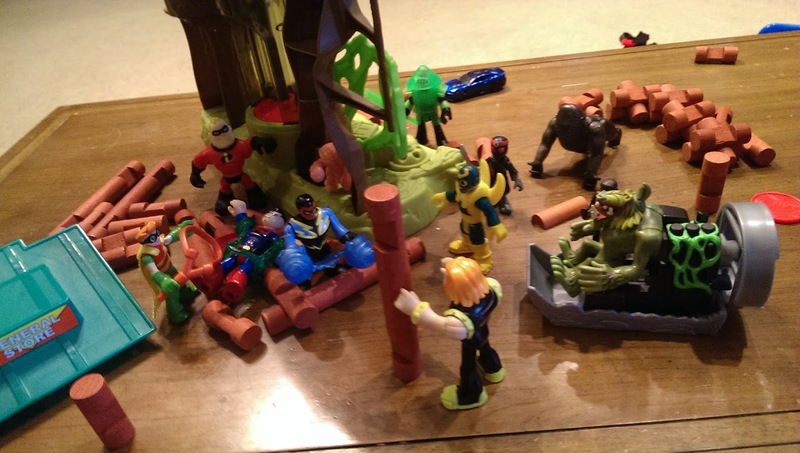 It was actually Gamma World. I started playing Gamma World in 1979, at the age of 10. Marvel Two-In-One #53 came out in 1979. It had cyborgs, weird powered beings and Project Pegasus! 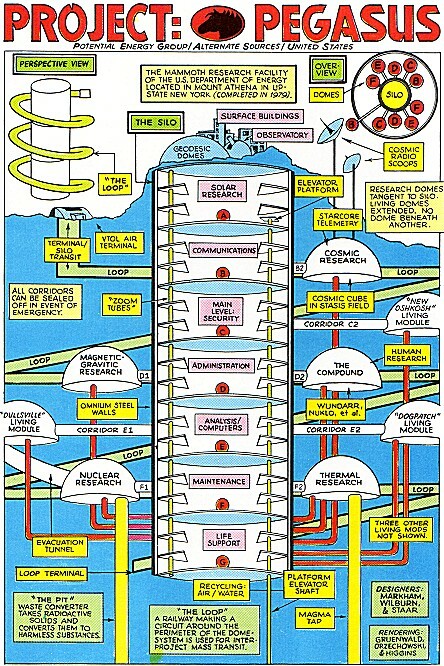 For those who don't know Project Pegasus was presented as a massive underground energy research station in the Marvel Comics. Getting this comic at the same time I was starting to run/play Gamma World made for a perfect match. My Gamma World game needed underground installations of the ancients and Project Pegasus was the prefect fit! On the surface it looked like just a small outpost or collection of buildings on a rocky outcropping. Perfect to plug into my Gamma World Campaign. My 10 year old imagination knew I needed underground vaults, bunkers and installations for my Gamma World game, and Project Pegasus was perfect for this, there were even maps! These were perfect to use as inspiration for my Gamma World games. I didn't know the term at the time, but Project Pegasus formed the foundation of my first Mega-Dungeon, although it was for Gamma World and not D&D. Different sections of the massive installation had different purposes, one held energy powered heroes/villains. Can you say perfect material for a Gamma World game! 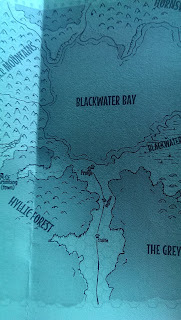 While my players, the most consistent being my cousin and my best friend Tormentor, although there were many others that floated in and out over the years, were the ones that played in my Gamma World Campaign the longest (over 10+ years) they didn't always know just how much of a power player the factions within and around Project Pegasus were controlling/influencing the Campaign. The Knights of Genetic Purity wanted to obtain it, The Created worked hard to maintain control of their sections of it and to continue "their" research. Restorationists saw it as a way to restore civilization. 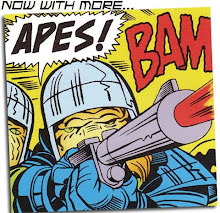 And the apes! Well they wanted to destroy any hint that humans once dominated the planet. 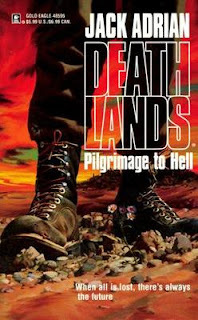 Many years later (1986) I discovered and hungrily read the first of the Deathlands series (Pilgrimage to Hell). 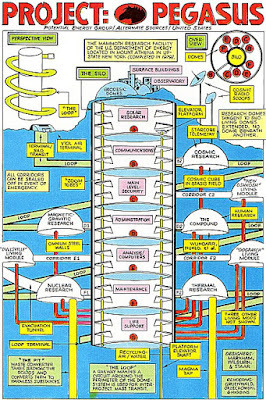 That series heavily revolved around secret installations with a special connection between them. I adapted that concept to my ongoing Gamma World campaign and tied it in to my Project Pegasus original campaign concepts. But that is another story for another time. Part of the reason I mention this whole history of my early Gamma World Campaigns, is that Christmas makes me nostalgic for Gamma World. You see, over the Christmas holidays from school, my cousin would come into town and my buddy Tormentor would come over and we would play Gamma World non-stop for days at a time, we'd go without sleep, overly caffeinate and it was glorious! So spend time with friends, family roll some dice and have fun! That's the best kind of memories. -Tis the Season! Pardon if this is a bit off topic, but had to share. My grandson is about to turn 4, and he is getting at the age where we can sit down in the floor, set up his growing collection of action figures, build a fort for them and do a bit of "gaming". Yes that is a Mutant Green Baboon driving a Hovercraft! 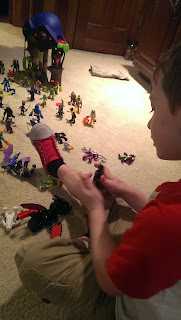 He did that himself, guess a love of apes runs in his DNA! -Good Times! In addition to the copy of WeirdWorld mentioned yesterday, I got a copy of Deathlok The Demolisher (The Complete Collection). 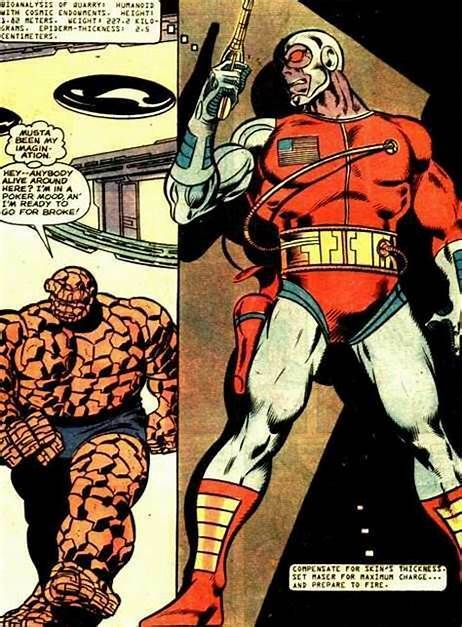 I've always liked this Marvel character, even though he was never really mainstream Marvel. I guess the Futuristic Cyborg nature of him appealed to the Gamma World fan in me. I've only had a few single issues with him in it over the years, so I'm really excited to be able to read up on his stories and adventures. Definitely should have some good material in this one for gaming purposes as well. In other news, I'm considering getting back to posting on my blog more. I let it slide, what with Graduate School, Work and posting more on G+, now with G+ going away, I'm thinking I may revisit blogging a bit more. Not sure if the audience is still out there, I know things have changed. I think next year will mark the 10 year anniversary of this blog. Wow, time flies. The OSR is what brought me back to gaming and got me started blogging in the first place. More to come! I got an early Christmas present from a friend of mine. 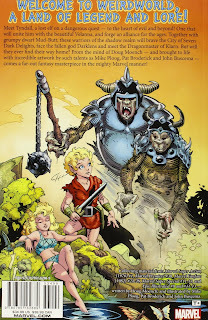 The complete original WeirdWorld TPB. I've been wanting this one for quite awhile now. 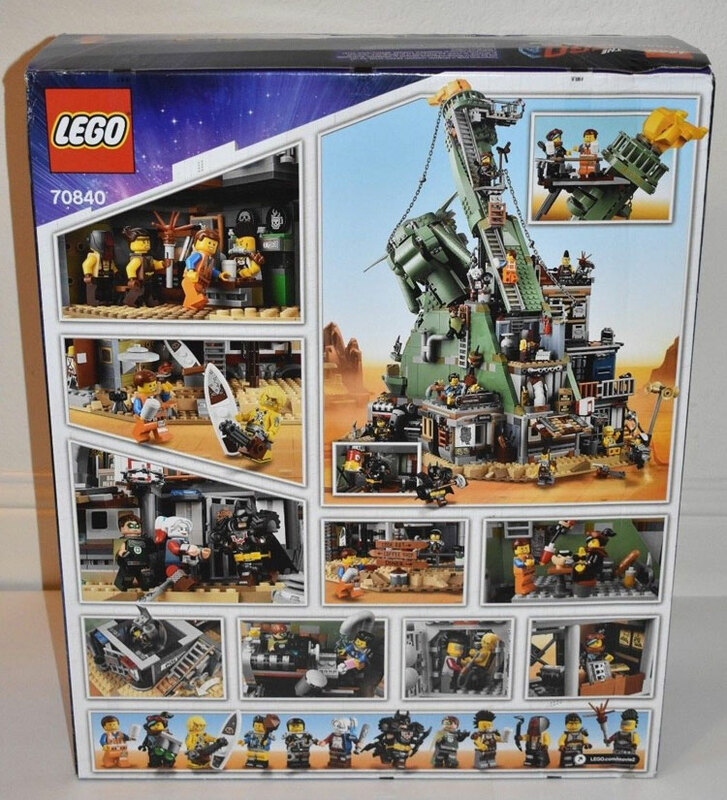 Really excited to have it as part of my collection. 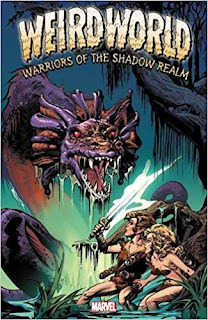 I can't wait to read it and loot/pillage it for gaming material for my future fantasy campaigns. This will be a great resource for my reading and gaming library! I hope you all have had a nice Saturday and have been able to squeeze in some gaming time or at least enjoy time with friends and family! I lost a friend yesterday. Someone I came to know through gaming and was happy to call a friend. One of the good guys. Always had the biggest smile. Would do anything for you. Super smart, talented and a heart of gold. I know they always say that about people after they are gone, but for him it was all true and more. I didn't know how sad he was. Behind that smile, unknown to me he was hurting inside. Now he is gone, we won't roll gaming dice together anymore, won't brainstorm our next campaign, won't scramble for the last slice of pizza, and won't laugh at each other's corny jokes. I miss you my friend. If you have that special friend in your life, check in on them today. Let them know you care and offer your support. God knows I'd give anything to be able to have my friend here with me today. If you are in that dark place and don't see a way out, please reach out to someone. You aren't alone, you've got friends. Just reach out to them. Please. 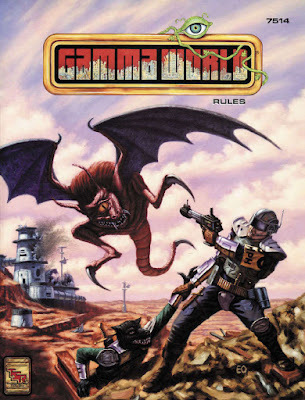 Gamma World 1st edition P.O.D. This is the one that started it all for me. I started gaming back in 79, yeah I'm that old. The first game I ran was Gamma World not D&D, sure I played D&D, or bumbled through trying to figure out how to play, but it was Gamma World that was my first true RPG Love. This edition isn't perfect, but it will always have a special place in my gamer's heart. I'm excited to see these old classics being made available as print on demand. It is a fun little OSR product stat'd up for the Swords & Wizardry Complete system, but easily adaptable to your OSR system of choice. The cover features my favorite class from the book the Deathwitch! It has 8 new classes and 5 new races. 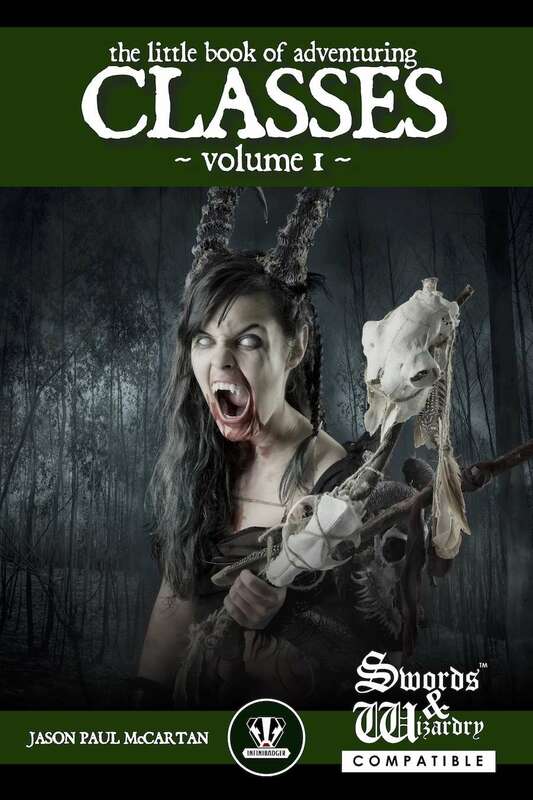 While I don't see myself using every race and class in this "little book", the ones I like, I really like and right now with it being Christmas in July you can get the PDF for $2.24 also if you are more of a print "book in hand" sort of person (such as myself) it is now available in print. Gamma World, Gathox and Mutant Miniatures! My recent Gamma World post got some great feedback, and got me thinking D&D is fun, but I need more mutants, guns and lasers in my life, uhmm I mean my games! 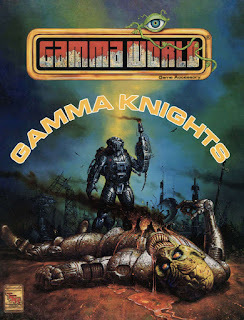 I see the Gamma Knights supplement is available in print now, over on DrivethruRPG, I didn't really use the Gamma Knights supplement that much in my Gamma World Campaigns, it has some rules for incorporating power armor into your games and also includes a boardgame option (which I never played). 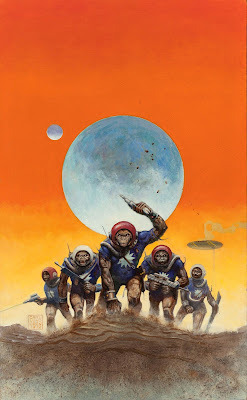 I am encouraged to see this in print however, in the hopes that eventually the entire Gamma World library will be made available again in print, many of my treasured Gamma World books are literally falling apart and look like they came straight from the apocalypse. 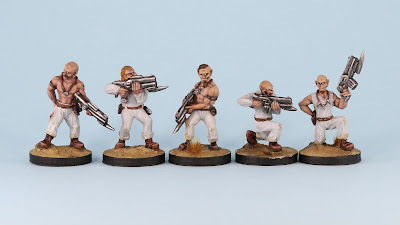 These would be perfect for some mutant warriors or could be great to use at Kermen if you are playing Gathox Vertical Slum. In fact I can see using Gathox with Gamma World, a mobile giant slum slowly walking across the wastelands. Could make for a really fun and interesting location in your Post Apocalyptic Campaigns. 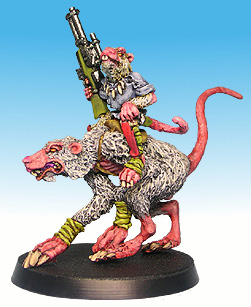 Oh and the Post Apocalyptic Rat Mutants are wicked cool! 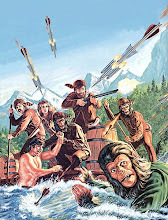 More Gamma World related posts will be coming soon! I know others have posted about this, but I would be remiss if I didn't share the awesome news that my favorite edition of Gamma World is now available once again in print! 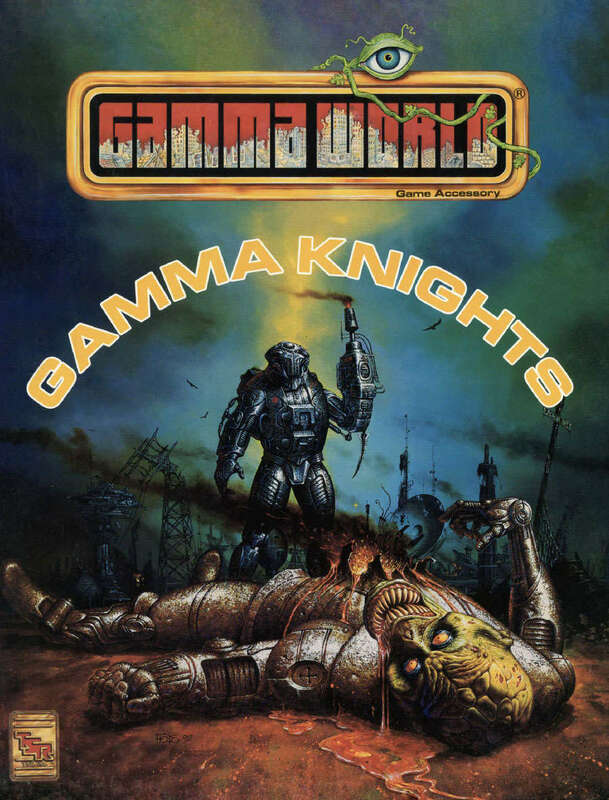 I've played and owned every edition of Gamma World, and this one, the 4th edition (No it is NOT 4E) hit that sweet spot for me. I believe this edition was even the first TSR product to test out Ascending AC (more or less). 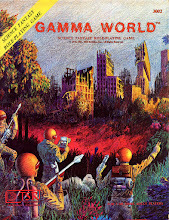 If I can talk my group into it, I will be digging out my Post Apocalyptic game notes and play some Gamma World! I still have my old tattered heavily played copy, but being able to get a new one is awesome news! Thanks to Derek Holland for letting me know this was available again. I started this blog way back posting about Mutant Future (still a great game), but Gamma World was my first RPG Love (yeah even over D&D). Awhile back I mentioned Gathox Vertical Slum a cool RPG/Setting for S&W Whitebox and other OSR games. I've since picked up the product in print, and I think it is a truly interesting, unique and Gonzo setting (and I mean Gonzo in a good way here). 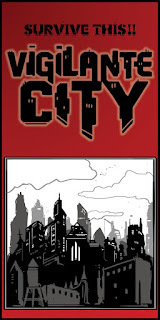 Recently the game's author, David Lewis Johnson sent me the first published adventure for this game; Quake Alley Mayhem. I don't do many reviews on my blog, and I tend to not do unsolicited reviews. However, I am a fan of David's work and had planned on picking this product up anyways.. so with that out of the way let me jump into the review. Quake Alley Mayhem is a tournament-style module set in the vertical slums of Gathox! 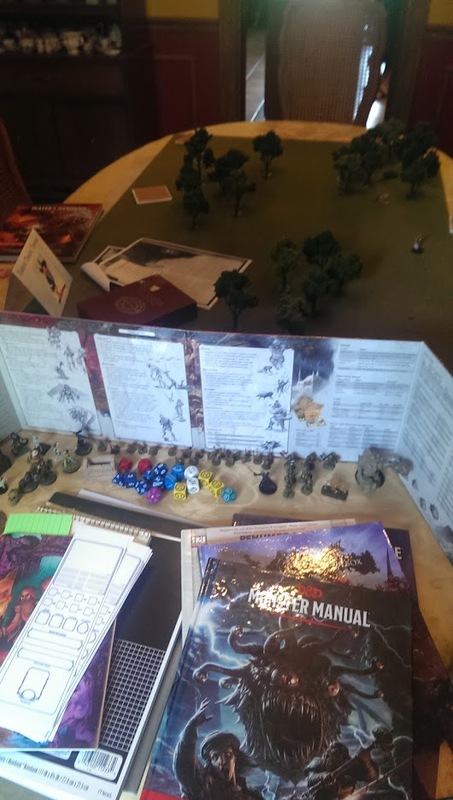 Even though I've been gaming since '79, I've never played a module in an actual tournament. Sure I played the heck out of the original Slave Lords, Giants series and other classic modules that had tournament options, but I've never played a tournament module in an actual tournament. So I will be evaluating this module as more of a one-shot adventure for your group or a possible adventure to add to your Gathox Campaign. The book is about 40 pages, with 24 (or so) pages of adventure, 7 pages of pregens, and a few pages of tables and other items. It is for 3-6 players of 1-3 level. The overall look and layout. The black and white text, is crisp, clean and easy on the eyes. I find it easy to read and follow, something I've had issues with in products from other companies. However, I have to say the pre-gen character sheets in the back are a challenge for me to read. Some sort of crazy font/look was done on the character sheets that for me and my Glaucoma are not pleasant or easy to read. However, this was only done for the character sheets, and not for the data on the sheet. The rest of the book is in an easy to read format. I've been a big fan of David's art for awhile and even commissioned him to do a character portrait several months ago (great work). The art in Quake Ally Mayhem maintains his standard of quality. I do wish there was more of it in this product. Not that it is short on art, I just like his style and want to see as much as possible. I would have loved to have seen character portraits of the pre-gens. As I mentioned this is designed as a tournament module, a timer features as a big part of the adventure and at certain times ground shaking things happen... I think this is a cool and interesting feature and would be just as fun in a non-tournament setting. The basic schtick of the adventure is that the characters are part of a gang sent to go do something... 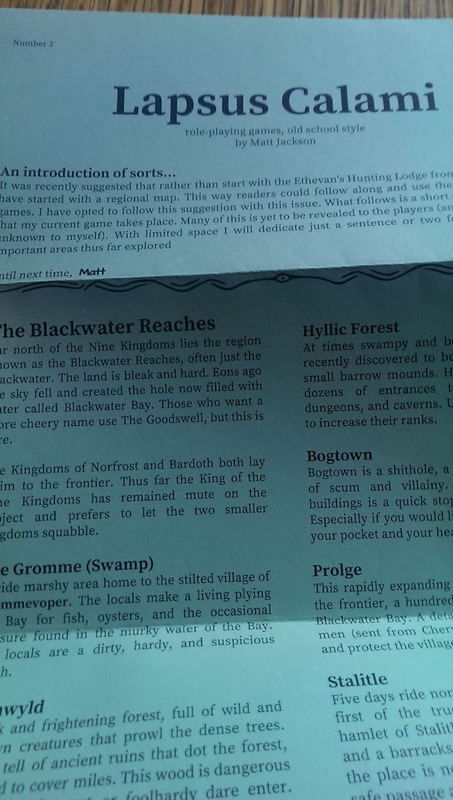 However, campaign notes are included to allow a pre-existing Gathox group of PC's (maybe a group that already played through the starter adventure in the Gathox core book) to play through the adventure. The adventure is overall pretty trap heavy, at least in my opinion. 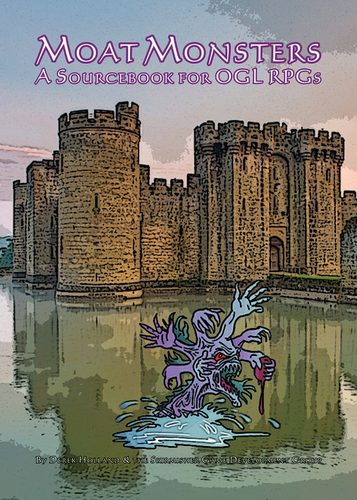 So if you or your players don't care for traps, then you may not enjoy this module. The traps fit the setting and the adventure and I found them to be interesting and appropriate. With that said, for an OSR-based game, this looks like a pretty lethal adventure. I estimate a pretty high PC body-count to get through this adventure. There is even a warning to that effect in the adventure. This works perfectly for a con game, with a bigger group of players, steadily getting whittled down as they get closer to the end. A DM running it for his home group as part of a campaign might want to do some tweaking or warn his players, or just run with it to reinforce how nasty, brutal and short life can be in the slums of Gathox. The module indicates it is for 3-6 players for 1-3 level. A party of 3, 1st level characters had better use some outstanding tactics, luck and skill to get through this unscathed. But it would be loads of fun in the meantime. If you enjoyed Gathox Vertical Slum then you need to get this product. Quake Alley Mayhem is a fun adventure to unleash at a con to show people how wild and crazy adventuring in Gathox can be. 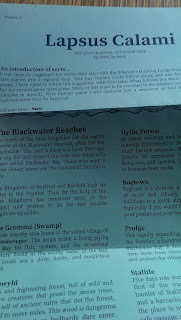 Or if you are already running a Gathox-based Campaign a challenging adventure to unleash on your players. Without the Gathox setting book, this product will not be as useful, but you could still adapt it to a strange urban sci-fantasy setting. If I can work a Con into my crazy schedule, I can see myself running this to introduce people to the wonderment and bewilderment that is Gathox Vertical Slum. 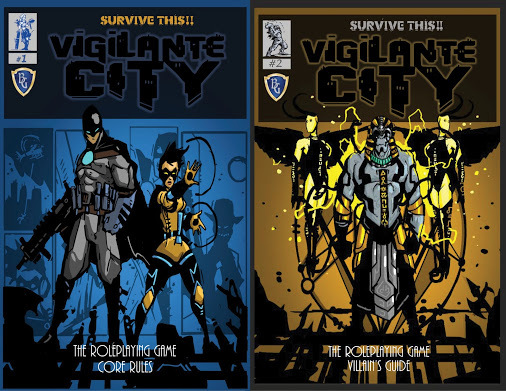 Otherwise, I'll be working it into the next Gathox Vertical Slum game that I run. 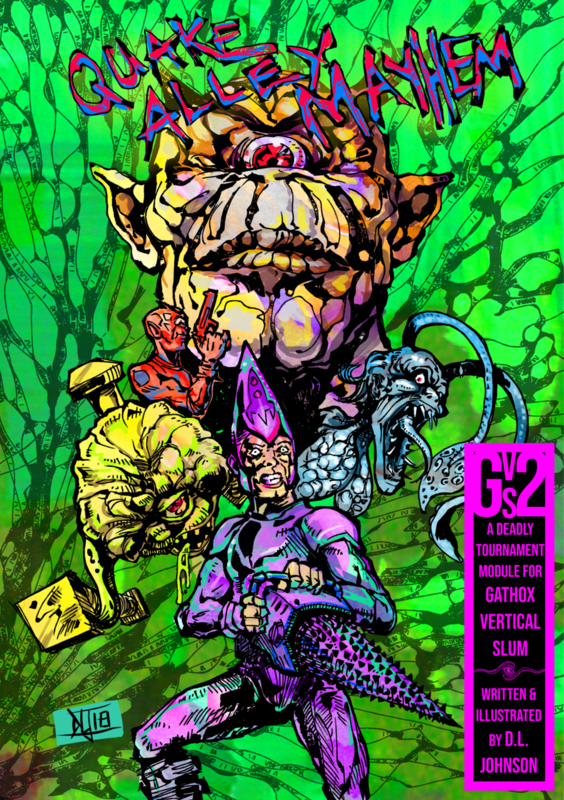 I hope David continues to put out products for Gathox Vertical Slum, it is a one of a kind Gonzo setting that you can use with your OSR system of choice.